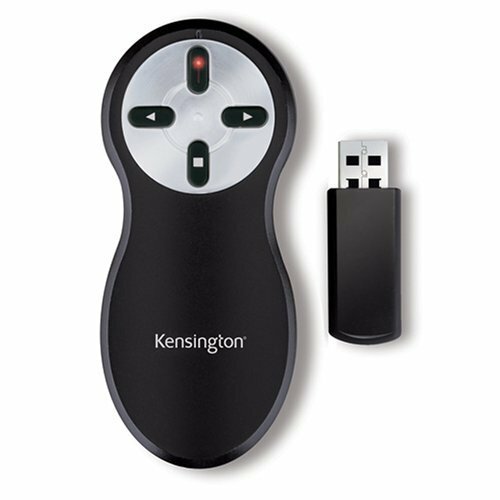 This may sound like a Kensington commercial, but in the last few months, I have realized the importance of a handy, reliable wireless presenter. When one is making a presentation, it can be a bit cramping to have to be stationed next to a computer to make slide transition. If one is standing still, there is also a bigger chance of the audience going to sleep! With a wireless presenter in hand, life is easier. Since one may also want to point to something specific on the slides, a wireless presenter with a laser point is desirable. This is especially the case if one is presenting on a gigantic screen. In recent presentations, I had been asking the organizer if they had a wireless presenter (which at least some one in a scientific audience always sees to have). However, I decided it was time to get my own. This Kensington presenter has proved to be really useful. All you have to do is plug the usb in the computer and play. The slide transitions work as well with PDF files as Powerpoint. If you are interested, check it from here.